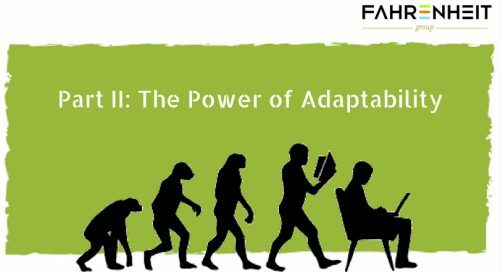 This is the second of a two-part series titled “The Power of Adaptability” that discusses the increasing importance of adaptability in today’s business environment. If you missed Part I, click here. In Part I of this series, I described how the increasing accessibility and presence of data, the impending generational shift, and the ever-increasing opportunities to improve business performance by leveraging software applications will reward small and mid-sized businesses that are able to embrace adaptability. How can businesses become more adaptable? How can leaders change their way of thinking about the problems that face them? Some companies have adaptability baked into their culture, and their leaders possess the skills to lead through consistent change. Other companies haven’t made adaptability a priority, and may have inadvertently placed barriers to change throughout their organization. Regardless of the starting point, the ideas below are valuable to consider when developing adaptability in the workplace. For companies that have little adaptability acumen, a great first step is to ask your employees for their feedback. Provide a forum for discussion about common challenges that, if solved, would improve the organization. This can be done via a survey, informal one-on-one conversations, or in a group setting. Cross-departmental conversations will likely uncover inefficiencies that have been glossed over for years. Solutions often benefit both parties. Over the last 5 to 10 years, many companies have created internal departments. These groups are made up of forward-thinking individuals who’s sole purpose is to re-think processes, vet new technologies, help breakdown silos, and ensure that changes are smoothly implemented. In most small and mid-sized businesses, this responsibility often falls on the senior executives. Even if an executive has the appropriate skillset, they may not have enough time to instigate and manage major change initiatives. In these situations, seeking external counsel can be valuable. Aside from bringing focus that executives may not be able to provide, an outside resource can bring new ways of thinking and a wide variety of experiences. They can uncover opportunities for improvement that those inside the company would have never identified. Because there is a consistent and increasing flow of new technology, education is more important than ever. You can develop internal capabilities by investing in training programs and conferences. The options abound and, with no coincidence at all, there are many software-enabled training options that deliver value at a reasonable price. Additionally, involvement in professional organizations will create a greater awareness of developing trends in your industry and, more broadly, in the world of business. A little training can go a long way in making your business more adaptable. However, to truly deliver results, your commitment to education and training needs to be a part of a long-term strategy, not just a one-time effort. Ongoing investment in education is the best way to ensure your organization can make continual improvements. Plan for this expense in your budget, and make sure employees know about your commitment. No matter the term you want to use, the concept of adaptability is more important than ever. Companies that choose to invest in adaptability will be better equipped to handle the rapid rate of change in today’s business environment.